Meet and greet Cas players later today. Cas Tigers fans are invited along to a town centre shop this afternoon to meet and greet players. Jordan Rankin, Adam Milner, Matt Cook and Daniel Smith will be there for fans to pose for selfies with and they will also be signing merchandise. The event, at Ramsdens in Castleford's Carlton Lanes Shopping Centre, is the first of a series of meet and greets, following the launch of their sponsorship agreement with the Tigers in February this year. 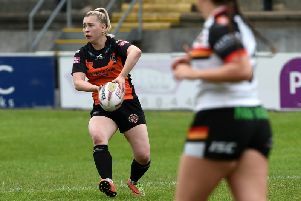 Rosalind Nunns, Castleford Branch Manager, Ramsdens said: “We’re thrilled to be able to give Tigers fans, young and old the chance to meet, take some snaps and share stories with their favourite players. We are looking forward to welcoming you all on Monday!" The meet and greet will be held from 4pm today (Monday, April 8).